Street Closure - October 2-4, Sonora drive is closed to traffic on both sides of Cliffridge Ave from 8am to 9am. If you must drive use the forest entrance on Cliffridge or park along Cliffridge NOT BLOCKING BUS STOPS. 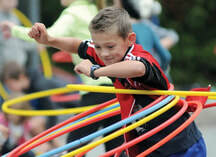 Events - Each day we have activities and events with grade 7 volunteers as the ring masters. Coffee will be provided each day, to reduce waste please bring your own mug. Grade 7 Volunteers - Please meet at the front doors each day at 8am for assignments, equipment and green shirts. Once all equipment is cleared you will receive a return to class slip. Volunteer forms are to be filled out and put in envelope located across from the library outside of Div 1 for signing. Be camera ready for class and individual photos. Please remember not to wear green as it does not show up well in the photos. October 4 Parent Education Event: "Are You Prepared?" Captain Dwayne Derban from the North Van City Fire Department and Carissa Boudreau from Clearly Prepared will provide an informative presentation on earthquake safety ahead of the Great BC Shakeout this month. If you order an emergency kit at the meeting (or online), please mention MONTROYAL as a percentage of sales will go to the MPAC. The website with kit information is HERE. When placing an order, please email the organizer directly at info@getclearlyprepared.com stating which kit you would like to order (& quote Montroyal in the title of the email). The organizer will contact you to process the order & delivery will be arranged. Our first PAC meeting of the school year will be held in the library from 7:30-8:30 pm. You can find the meeting documents HERE. We hope to see you there! ​A yellow notice went home on September 29th with details. Students will receive their “family group” assignment on Monday, October 2 and divisions are asked to collect items for the Harvest Project. Boxes will be located in each classroom. We are pleased to host the Scholastic Book Fair at Montroyal once again! This event is designed to deliver a great selection of reading materials to our students while benefiting the library, classrooms and our reading programs. This is a school event but manned mostly by volunteers. Click HERE to find your role! Student Volunteers (Grade 7) sign up at school. To support our fundraiser with organic BC apples, order the Best of Fall Box at SPUD.ca/fundraising. If this is your first time supporting our fundraiser through SPUD, enter the code FUNDRAISING at checkout and select MONTROYAL from the drop-down list then complete your order. Your Best of Fall Box will be delivered to your home or office and ​25% of your produce box purchase will be donated to our fundraiser! ​BCCPAC strongly believes that every child deserves equitable access to a full day of education. BCCPAC is conducting a three-minute parent survey to confirm how widespread this issue is across BC public schools:https://www.surveymonkey.com/r/BCCPACFullDaySchool. The budget update is a good first step but more needs to be done. Read the MEDIA RELEASE as parents voice concerns about effect of TOC (Teacher-on-call) shortages on students.